The choice between fresh versus canned stewed tomatoes is not all that obvious. It's not a clear cut case of "fresh is best". IF they are at the peak of the tomato season. IF they are San Marzano tomatoes from Italy or, at the very least, some other variety of plum tomatoes. Plum tomatoes are tomatoes specially cultivated for cooking, making tomato sauce and preserving as canned stewed tomatoes. They are oval and elongated rather than round. They also have fewer seed compartments, usually only two. This makes plum tomatoes more firm and fleshy and also less juicy, which is why they are particularly good for cooking and food processing. And of the different varieties of plum tomatoes, San Marzano is widely considered by many chefs to be the best. So IF you can find fresh tomatoes that meet all the above conditions, which means IF you live in or nearby a tomato farm, preferably in Italy, then, at certain times of the year, fresh is best. In that case, you are recommended to buy as much as possible, make your own tomato sauce and can / bottle them for your own use until the next tomato season. And IF you do this, then your "fresh" tomatoes will not be much different from canned stewed tomatoes anyway. Sure, you make it yourself according to your own recipe, and you make it in relatively small batches. These are plus points compared to commercial canned tomatoes. But it is not that great an advantage. For the rest of us who are less fortunate, canned stewed tomatoes are the way to go. For they meet all or most of the conditions listed above. Mutti, the brand that I usually buy, states on its label that its tomatoes are canned on the same day that they are harvested. How much fresher can you get? In contrast, the "fresh" tomatoes that we get in the supermarkets were probably harvested green weeks or months before they reached us, and then forced ripened. Even then, they are not fully ripe but only partially. They taste more sour than sweet, more bland than rich. And don't worry too much about tomatoes being a canned food. Unlike typical canned foods that come loaded with preservatives, artificial coloring, artificial flavours and other chemical additives, canned stewed tomatoes are relatively "clean". They are among the few canned products that contain very few - or even zero - chemical additives. Most brand contain just four ingredients: tomatoes, tomato juice, salt and citric acid. 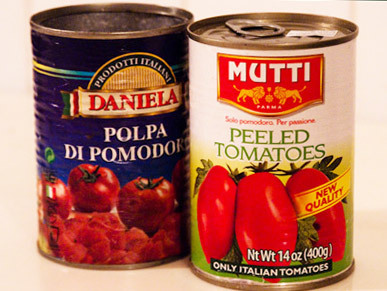 The Mutti and Daniela brands featured here - as well as some brands of organic canned stewed tomatoes, contain just two ingredients - tomatoes and tomato juice. Citric acid - the acid found commonly in citrus fruits like lemons and oranges - is used as an acidifier or acidity regulator, not just in canned tomatoes but also in other canned fruits and vegetables, soft drinks and many other canned foods. But the type of citric acid used in food manufacture is, of course, factory made and not natural citric acid. I was puzzled at first... why would food manufacturers purposely add citric acid to make caned stewed tomatoes sour when the best quality, vine-ripened tomatoes are supposed to taste sweet? I found out that it is a food safety measure, to prevent the formation of molds. Tomatoes naturally do contain citric acid. Even the ripe, sweet-tasting tomatoes do, just that the sweetness masks the sour taste of the citric acid. However, food canning laws require that the canned product has a certain level of acidity to prevent mold formation. Tomatoes are at the borderline, containing just about enough natural citric acid to meet the regulations. But most food producers add a bit more just to be safe. If, like me, you prefer more natural products, then make some effort to read the ingredients list more carefully. Canned tomatoes without citric acid are not easy to find. Out of more than 10 different brands on the supermarket shelves, I found only two so far. But they are avaialble, you just need to look harder. However, I have yet to find a brand of San Marzano canned stewed tomatoes. I, too, need to look harder. In any case, citric acid is a relatively safe food additive. A very small number of people suffer from citric acid intolerance and may experience symptoms similar to food allergy if they consume too much. But this condition is extremely rare and most people need not be concerned. Fresh and canned stewed tomatoes can, of course, be used interchangeably in pasta recipes. Some pasta cookbook writers will say that a fresh tomato sauce tastes so good that it cannot be matched. But that's is provided you can get vine-ripened, freshly harvested fresh tomatoes. If you insist on making your own fresh tomato sauce, at least try to get fresh plum tomatoes. Because they are firmer, plum tomatoes do not get so easily spoiled by handling and shipping, so you are more likely to get them in a state closer to naturally vine-ripened. But these tend to be costly. I sometimes use cherry tomatoes to make a fresh tomato sauce. Cherry tomatoes, especially the elongated varieties, are related to plum tomatoes although they tend to be a bit more sour. And I can get organic, ripe cherry tomatoes relatively cheaply. I would never, however, make a tomato pasta sauce using half-green, half-ripe regular fresh tomatoes! Click here for an index of pasta recipes using canned stewed tomatoes.